RESTON, Va. – Physicians may soon have a new way to measure the efficacy or failure of hormone therapy for breast cancer patients, according to new research published in the February issue of The Journal of Nuclear Medicine. Researchers report that positron emission tomography (PET) imaging with 18F-fluorofuranylnorprogesterone (18F-FFNP) has been found to successfully measure changes in progesterone receptor (PR) levels resulting from a short-course estrogen treatment, also known as an estradiol challenge. Figure 5. 18F-FFNP uptake in tumor xenografts expressing PR-A or PR-B. 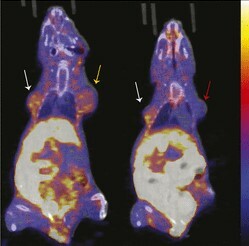 Representative coronal 18F-FFNP PET/CT images of MDA-MB-231 (red arrow), 231 PR-A (white arrows), and 231 PR-B (yellow arrow) tumor xenografts (19 d after implantation) from 12 mice imaged 1 h after injection with 10 MBq (270 μCi) of 18F-FFNP. Physiologic uptake from hepatobiliary clearance is also visualized. Credit: K Salem et al., University of Wisconsin School of Medicine and Public Health, Madison, WI. For questions or to schedule an interview with the researchers, please contact Rebecca Maxey at (703) 652-6772 or rmaxey@snmmi.org. Current and past issues of The Journal of Nuclear Medicine can be found online at http://jnm.snmjournals.org.